The new campus of Zurich University of the Arts was, until recently, a dairy factory, known for its signature yogurt—packed in instantly recognizable small, brown, glass jars. After production was relocated to elsewhere in Switzerland in 2000, the enormous plant, located in a fast-changing former industrial neighborhood, was home to clubs and restaurants, as well as artists, who found the plant’s vast spaces perfect for studios. 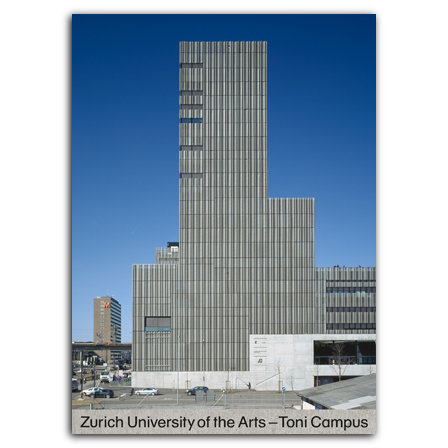 In 2006, Zurich University of the Arts began working with architects EM2N to transform the building into the university’s new home, which opened in 2014, as well as into a public space. This richly illustrated book documents that process, as well as the renovated building—which fills the original structure with a state-of-the-art educational infrastructure offering studios, offices, lecture and concert halls, a movie theater, galleries, a museum, restaurants, a music venue, and even one-hundred apartments. With contributions by Felix Escher, Thomas D. Meier, Katharina Nill, Kathrin Passig, Janine Schiller, and Peter Weber; graphic art by Ingo Giezendanner GRRR; and photographs by Regula Bearth, David Bienz, Barbara Bühler, Johannes Dietschi, Hanspeter Dudli, Filip Dujardin, Betty Fleck, Roger Frei, Simon Habegger, Simon Menges, Thomas Schlup, and Roland Tännler. is a publicist, editor, and a research assistant at Zurich University of the Arts. is an architectural historian, cultural scientist, and a lecturer in cultural journalism at Zurich University of the Arts ZHdK.